If your new, welcome to Warriors, Into The Wild! If your back, then welcome back! ~ Cinderpelt, Founder of the site. 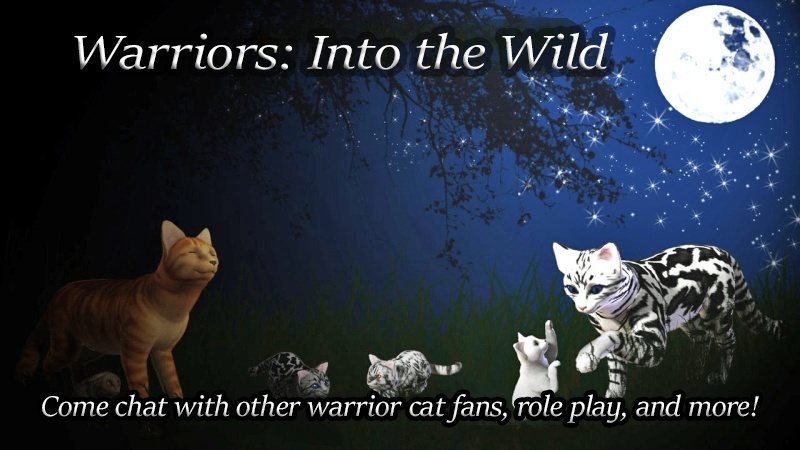 Warrior cats RPG, where YOU live the life of a warrior cat. Come along, experience the grief and hope of a warrior! Live it all yourself! News~ Rogues are stealing all the food and hunting in FireClan territory, while Twolegs are slowly, one-by-one cutting down all the trees at the edge of the forest in their territory. This means FireClan has to send in more hunting patrols and less border patrols, and may get attacked by a Tribe. News~ The nearby stream has been blocked by a dam, so one half of the stream is flooding and engulving prey grounds, yet the other half has no water at all. FlyClan cannot reach the flooded part of the stream, so they are having to steal water from other clans. News~ Upwalkers are invading and trying to ruin their territory. No one knows how they will save their sacred area, yet they won't give up and know it's possible. News~ Upwalkers have been raiding along the cliff edges more and more, and are disrupting the Clan. The cats who attempt to go over have either been pushed off the ledge or taken by the Upwalkers. News~ Warriors have been finding out what Daisystar is doing during the night with Blair and will try and take them down. Daisystar & Blair run away to stay with their former Upwalkers, until one warrior that didn't want to kill her loyal leader and the small little kitten tries to convinced them to come back. No one knows what will happen then..
News~ The deputy Cheetahheart is desperate for power. She is planning to kill the medicine cat and medicine cat apprentice, then senior warriors, and then the leader himself. She has lots of plans ready, and will do everything she can to gain power. What will happen to LeafClan now, with a threat boiling from within? Even worse,n early all her clanmates admire her. Except Cheetahheart's apprentice, who watched her kill the former deputy to gain power. News ~ Demon Shadow, the founder of this Tribe, has been visiting some prey-hunters, kit-mothers, to-be's, cave-guards, and the current healer of this Tribe in their dreams. He says there is a great danger coming, but no one knows what. Demon Shadow says they will find out on their own, only to realize that Demon Shadow himself is the danger and will have killed innocent to gather souls so he could reincarnate and take over. They don't know how to stop him, but they also don't know how to join him..
News ~ The Healer falls in love with Half Moon's Healer, but they are in war and won't stop until the other one stops, so he cannot confess his love to her. Yet, Half Moon's Healer despises him and will keep fighting. News ~Someone has been stealing kits from Half Moon Tribe, but nokitty knows who. Because of this, the Tribe is short with prey and has lost many cats already, so they have to find out who is doing this and steal their kittens rightfully back. LeafClan - May all cats old enough to climb the rocky cliffs gather! CloudClan - May all cats old enough to jump the Ocean Cliffs gather around for Clan meeting!! OceanClan - May all cats old enough to swim the Deep Swamp gather! IceClan - May all cats old enough to run across the ice safely gather! For clan battles, please reference this instead of making up your own ninja-moves. Back Kick - Explosive surprise move to catch opponent from behind. Judge opponent's distance from you carefully, then lash out with your back legs, taking all weight on your front paws. Alder Bar-The bark is used to treat cats who get toothaches, and the pain may heal. Hard to find. Blackberry Leaves-These leaves are chewed into a pulp to treat bee stings. Hard to find. • If you have any questions, ask an Leader, Deputy, Medicine Cat or a Senior Warrior! • Poor behavior will result in a warning. Continuing this behavior, you will be banned from the chat. If you continue this even further, then you will be banned from accessing the forum for 24 hours. After that, you will be banned completely. » Sky Fire that Lights Sky (Sky) Finished!! !